Here is subtle-hued February with a detail from one of the tests for my thesis project! Just like before, the desktop image uses a white background with a handwritten calendar for the month, and I’ve added the most important moon phases too: ○ full moon & ● new moon. The resolution is 2560×1600, which should fit most computer screens. You can download different sizes from the link. So here you have a picture of white translucent glass that is sometimes referred to as milk glass or “opaline” (milk glass can also refer to transparent glass with a thin layer of white glass). It was incredibly sought after in the Art Nouveau and Art Deco period for its opalescence and color shifts, reminding of opal gemstones and moonstones. One artist that is typically associated with it is René Lalique, who trained as a goldsmith and became a glass artist; a quick search on “Lalique + opalescent” gives you an indication of his range. This curious glass shifts from yellowish to blue, depending on how the light hits it. You really have to see this for yourself because it’s amazing and mysterious… If you didn’t know better you might think it was just a bland piece of glass, but once it catches light it comes to life! This color shift is known as Raleigh scattering, an optical phenomenon that also explains why the sky is blue. …that I made into a pendant back in 2010! Happy 2016! Here you go, a bright new look for your computer desktop! I want to breathe new life into a little project that I had to abort way too soon because of college work… but now the end is in sight, and I hope you will like the new glassy inspirations I’m cooking up for you this year! The resolution is 2560×1600, which should fit most computer screens. This blue chunk of glass is a treasure I picked up in Venice (when I visited the city in 2013), on the “glass island” Murano . It has been molten and hotworked with in the glass blowing studios. 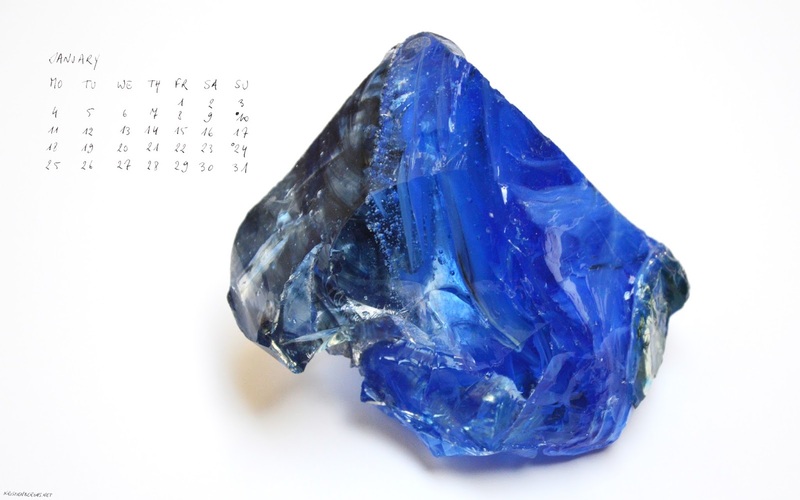 This is part of the waste, actually, but don’t you think it looks like a gemstone? //embedr.flickr.com/assets/client-code.js A sunrise video from this morning, with planes drawing lines in the sky, the sun catching them and the wind diffusing them – this is my goodbye to 2015… So happy to share this room with a view with you on the blog and in the photos (where you can watch a full screen version). May 2016 bring you many new wonders and discoveries! Next to the glass fur project and the research into clay to glass, I’m trying my hand at verre églomisé, the art of gilding glass. Ever since we were introduced to goudleder – “Cuir de Cordoue“, in Prof. Em. A. Bergmans class of History of interior, I’ve developed a fascination for gilded surfaces and am doing some research on it, especially (guess what…) how it’s applied to glass. Even in the history of glass alone there is so much to discover… Do you recognise this mirror from a famous 15th century portrait? And did you know that this type of convex round mirror was called an “Oeil de sorcière” (witches’ eye)? “The Arnolfini Portrait (mirror detail)” by Creator:Jan van Eyck – Image:Jan van Eyck 001.jpg. Licensed under Public Domain via Commons. Verre églomisé was a decorative technique, often combining the gilded surface with reverse painting (on the back of the glass), so that the glass itself can act as protection and lens (of sorts). Mind you, this wasn’t the way functional mirrors were made in the past; since the Renaissance a tin-mercury amalgam was used to create a smooth reflective surface, and Venice was one of the manufacturing centers. A detail of the copper mirror, seen on the back showing the bare metal leaf. For inspiration I’ve turned to Pinterest, with a collection of artistic and contemporary examples. Feel free to take a look! The little test dome I showed you last time has been fired. It was fun to revisit the techniques I had acquired for my research into historical pâte de verre (the wax dome itself was one of the models after Despret’s that were left over! ), but giving it a more personal and decidedly prickly twist. With the wax steamed out, only the glass pins remained embedded in the mould. The glass pins that I had heated one by one in the flame of a candle and pushed into the wax, had all been embedded in the plaster/silica mould. The wax was steamed out and I added pâte de verre to the surface, and fired it in the kiln. Since it was such a small form, I did this in my own tiny Paragon SC3 kiln instead of the industrial ones at Sint Lucas. I hadn’t used the oven in quite a while so I was happy to find out that everything still worked! The mould after firing (on the marble cement floor in the oldest part of the house). Thanks to an old toothbrush and a couple of wooden toothpicks I eventually managed to not break every pin I had put on earlier. Heh. But it was tricky! The secret was mostly to soak it in warm, salty (soda) water for a couple of hours, and then the very gentle prodding began… it was a calm and precise work, taking care not to use too much pressure. Here you go: a glassy punk! This is the result so far: a translucent dome partly covered with glass pins. It’s a start; it already tells us a couple of things. I like the translucency so that it almost fades into the background…The surface looked almost blurred, only when you examine it from close by you see the “hairs”. But it needs more tweaking and experimenting. One thing I don’t like is the diameter of the hairs, which look more like pins than fine hairs. This has to do with the proportions and if the model had been bigger it wouldn’t have been such an issue. The plan is to scale it up. Another thing is this quality that fur has; since it is embedded in elastic skin it moves and ripples with movement or draping. This I’d love to transfer to the glass fur too… So I’m experimenting with more elastic materials for the skin: transparent silicone and textiles. The results of the test firings were more startling than even he had dared hope. After five hours in the kiln, Böttger records, the first sample had a white appearance; the second and third had collapsed; the fourth remained in shape but looked discoloured. The last three held him spellbound. These small, insignificant-looking plaques had withstood the searing heat of the kiln; they had remained in shape and intact. More importantly they were ‘album et pellucidatum‘ – white and translucent. In the dank, squalid laboratory the twenty-seven-year-old Böttger had succeeded where everyone else had failed. The arcanum for porcelain for which all Europe had searched now lay within his grasp. Gleeson, Janet. The Arcanum: The Extraordinary True Story. Transworld Publishers, London, 1998, p. 56. Skin protects our bodies, and skin coverings reinforce that function. Maybe the cats have anything to do with my fascination of fur and how a mass of hairs becomes an entity of its own… Fur is vital for animals and in archetypal symbology it has the ability to foresee danger (see the quote below, from C. Pinkola Estés’s Sealskin, Soulskin tale). Carefully cut glass stringers, heated in the flame of a candle and prodded into the wax model. Glass is very thermoplastic; it deforms and distorts in intense heat and can melt into a puddle…but it can also just subtly start to move, under the influence of gravity in a heated kiln or in the flame of a burner. I love how the surface seems to be dissolving when see through this mass of stringers! I want to find out how the heat of a kiln will calm down these hairs; whether gravity will enable them to relax onto each other. But before that is possible there are a few more steps to go! It will be cast into a mould (or rather, I’ll build a mould around it), the wax will have to melt away so it can be filled with pâte de verre, it will be fired a first time…the mould has to be broken and washed away very carefully and then I will put it back in the kiln, and let gravity do its job… Who knows, in a later stage I can manipulate the slumping fur in the kiln myself. a little detail of Assepoes’s nose, showing how her fur “flows” in several directions. If we delve into the symbol of animal hide, we find that in all animals, including ourselves, piloerection – hair standing on end – occurs in response to things seen as well as things sensed. The rising hair of the pelt sends a “chill” through the creature and rouses suspicion, caution, and other protective traits. Among the Inuit it is said that both fur and feathers have the ability to see what goes on far off in the distance, and why an angakok, shaman, wears many furs, many feathers, so as to have hundreds of eyes to better see into the mysteries. The sealskin is a symbol of soul that not only provides warmth, but also provides an early warning system through its vision as well. Clarissa Pinkola Estés. Women who run with the wolves: contacting the power of the wild woman, Random House, London, 1998, p. 267. A little inspiration: my board Skin, fur and scales shows how other artists and designers explore this theme! So while I was busy I decided to catch up with some of my favourite podcasts. I don’t always have time to listen, but some tasks – like painting the walls, or when I’m knotting or stringing beads – are so inviting to listen to other people tell stories. I kind of miss the days of the radio plays… I remember taping a radio play about Felix Mendelssohn who wrote his first opera as a teenager and my nerdy 14-year old self thought that was so cool…and it prompted me to try some composing as well. I loved discovering composers, artists and other famous dead people and how they were as kids. It was reassuring that they were often just as awkward and weirdly obsessed with music or art or whatever their thing was. Now I still love to discover how artists live and work or what makes them tick, and if they’re alive and well it’s a big bonus! Hehe. So I listened to The jealous curator, who has a conversation with a different artist each week. I love how relaxed the conversations are although there’s room for the more challenging aspects of creative life (like that pesky inner critic)…but that’s often exactly what appeals to me. The artists are usually new to me, mostly American or Canadian but there are some Belgians on there too (not on podcast though). It’s great to discover new artists! There are a couple of other blogs that also feature artists: for Dutch speakers there’s the excellent blog of Hilde van Canneyt, Gesprekken met hedendaagse kunstenaars, and I also check Freunde von Freunden. In this international blog a wide range of creative professionals over the world get interviewed and pictures of their home and studio are shown, but I don’t always feel a connection with them. I guess it has to do with the more formal style of the interviews, the focus on success and confidence, and the often incredibly gorgeous interiors. I mean, they are fabulous and to some extent inspiring, but the they don’t always feel lived in. One of the first things that took form after I moved here: a home for the books. Check out the titles if you’re curious on flickr!